It can be mentally challenging and a taxing activity to make sales calls over the phone. We can improve our results and stamina by putting aside some time and effort to improve our mind. Going through some mental steps and exercises to help improve your mental state and frame of mind is what we are referring to. This can have a positive impact on your results. Going through a mental exercise periodically to give ourselves affirmation of the great things that we have to offer the people that we’re calling is one thing which can be done to improve our mind. When we cold call a prospect we can easily have a needy mental frame or mental state of mind because it is easy to feel like we have a need to sell something. If we stop for a moment and think about it, the products we sell offer a business value to our clients. We have a greater problem in our hands other than trying to determine how to improve our phone sales calls if our products don’t offer that value. We can greatly improve our mind and our mental state by stopping to think about the business value our products offer, the great qualities of our company and our personal strengths as a sales professional. We can move forward to focus on improving our voice once we have improved our mind. The only real thing that we have to communicate with are the words we say and the way we say them during phone sales calls. It’s important to keep in mind that the way we say our words is the more important and impactful variable in that equation. In support of this is the saying that, “it is not what you say, but the way you say it that matters”. As a result, improving your voice and tonality can greatly impact your effectiveness of selling over the phone. Now, half the work is done when we have spent time improving our minds because being in a stronger mental state will come through in our voice and tonality when talking on the phone. Smiling when making phone sales calls is another simple thing that we can do to improve our voice. It might sound like wasted effort since the people you’re talking to can’t see you, but you can hear a difference when someone is smiling while talking over the phone and this has a positive impact on sales results. There are very specific things that can be done and not done to impact our results which is one of the great things about sales. With that being said, there can typically be a return on investment for time spent in the area of continuing to learn and cold call training can typically have an immediate impact on phone sales results. 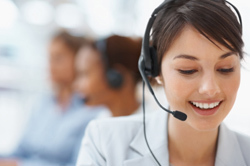 SalesScripter provides cold call training to help sales pros with phone sales calls.